he ancient Babylonians had a myth about a great universal flood sent by their gods to destroy the life of all the humans on the face of the earth that they had made. Only one man and his family made it through – survived by building a great ship and riding it out. And if that story sounds a bit familiar it should. It is a basic plot that I am sure all of us would recognize if we know anything about the Bible. The ancient Babylonian story was not exactly the same, of course. The hero of the story was named Utnapishtim instead of Noah – a fact that I share with you mostly because I just like to say “Utnapishtim.” And, of course, the deity involved in the Babylonian story was not the God of Israel but rather a collection of ancient Babylonian gods. But the story corresponds so closely that most scholars would say that the biblical story is dependant on the much older Utnapishtim story. This is, in itself, not all that surprising. The ancient Hebrews were a part of the ancient world in which they lived and they knew the stories of their neighbours. They quite naturally developed their own versions of those stories which they told for various reasons. Some of these stories they told to work out their understanding of ancient events – and there may well be ancient events behind this one – the memories of some ancient flood that was likely not universal but that devastated an entire region. But these stories weren’t just about things that had happened a long time ago. They were mostly told as a way to process the things that they were coming to know about the God that they worshipped. For example, one of the big differences between the Babylonian story and the biblical story is the reason for the flood in the first place. In the older story, the Babylonian gods basically decide to wipe out the humans because they are too noisy. Like grouchy neighbours on the upper floor of an apartment building, the gods are upset about all the noise downstairs and the flood is just their way of turning on all the taps until they overflow to “persuade” the noisy neighbours to move out. And, for the Babylonian gods, the only regret that they have for doing this is that when the human race is wiped out, there is nobody left to feed them with burnt offerings and so they do come to regret it, but for rather selfish reasons. The ancient Hebrews heard that story and they knew that it didn’t sound quite right. At least it didn’t seem to be how the God that they were coming to know – the God who had made the people of Israel his own people – would behave. So the story they told mostly differed in how it reflected the relationship between God and the people of the earth. So, for example, instead of being annoyed that the humans are too noisy, God, in the biblical story has a legitimate beef with the people of the earth. They are evil, given to violence and murder, and God decides he is not going to stand for it any more. So there is the first difference from the gods of Babylon. The God of Israel is motivated by justice. The second difference in the biblical story is God’s response after the disaster. God, like the Babylonian gods, does regret the slaughter of the flood. But the God of the Bible doesn’t merely miss the sacrifices of the people. Yes, it does say in Genesis that “the Lord smelled the pleasing odour” of Noah’s sacrifice after the flood, but rather than inspiring God’s hunger, the Bible says that the sacrifice reminds God of his love for the people he created. He realizes that to seek to destroy them was wrong, that it didn’t really solve anything but only made things worse. So here is the second wonder about the God of the Noah story – he is able to learn and grow. It is a bit surprising, perhaps, if you have always believed that God never changes, to read that God changed his mind after the flood. But I honestly believe that that passage is more about the changing and growing realization of the people who were telling this story as they learned more about the God that they worshiped than it is about Godself changing. The more they came to know this God who they were exploring by telling these stories, the more they discovered, especially about God’s devotion to justice and what was right. But there is another aspect to the story of the flood that sets it apart from so many other similar stories that come to us from the ancient world. God doesn't just repent of what he has done, he makes a covenant. And here is the most amazing thing of all in this story about what the ancient people of Israel learned about the God that they worshipped. He was a God who made covenants. From what we can tell from the history of the ancient Near East, this was something that was unique. No other ancient peoples had a covenant making God. This was probably the first thing that set the Hebrews apart from their neighbours. Now covenant is not necessarily an everyday word for most of us, so I do want to make sure we all understand exactly what one is. A covenant is an ancient word for what we might call today a contract or a deal or an agreement. In ancient times covenants were originally made between larger groups of people like tribes or nations, so you might also say that a good word for it might be treaty. When ancient people made a covenant, they would come together and decide on the terms of their accord – what each party owed the other. There was usually some kind of document that laid out all of the blessings that the participants in the covenant would receive if they kept the terms and (since you can’t have the one without the other) there would also be a list of the curses that would be visited upon them if they broke the covenant. 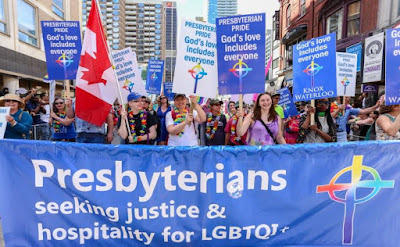 In addition, there would be some sort of monument set up that would remind the parties of the commitment that they had made so they would not break the terms of the covenant. These covenants were extremely important in the ancient world. 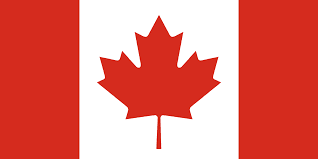 They created peace and prosperity for those tribes and nations that entered into them. But, generally speaking, in the ancient Near East, covenants were only agreements made between tribes and nations or between individuals. But the ancient people of Israel came to understand something quite different – that they had a God who made covenants. God even sets up a monument for this covenant. “This is the sign of the covenant that I make between me and you and every living creature that is with you, for all future generations: I have set my bow in the clouds, and it shall be a sign of the covenant between me and the earth.” He is speaking, of course, of the rainbow that often appears in the sky when there is rain. But the symbolism of it is very significant. God speaks of laying down God’s bow – that is to say his war bow, his weapon of war. It is a clear demonstration of his commitment to no longer use violence against this world. What’s more, he states that the reason why the bow will appear is not to remind us but God to keep the terms of this covenant. 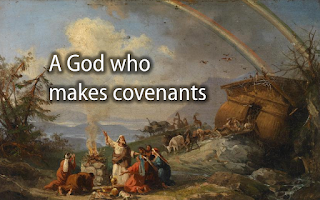 “When I bring clouds over the earth and the bow is seen in the clouds, I will remember my covenant that is between me and you and every living creature of all flesh; and the waters shall never again become a flood to destroy all flesh.” This reminder of the covenant is so important that you probably noticed that it is repeated three times in the text. 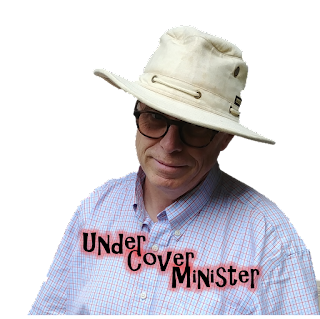 And so, in the Noah story, we are introduced to this radical idea of a God who makes covenants – who voluntarily puts himself and his integrity on the line for the sake of his covenant partners. And this one unique trait that is revealed about the God of Israel drives much of the rest of the scriptures. When we next encounter God, we find him choosing to make a covenant with one particular righteous man and wife pair: Abraham and Sarah, and to make a nation out of them that will bring a blessing to the whole world. Later, because of that covenant and because God remembers his covenant promises, he saves the descendants of Abraham and Sarah from slavery in Egypt and creates them as a nation. He also sends Moses to teach them, through the Law, how to live up to their end of the covenant. And throughout the Old Testament we are told the ups and downs of that covenant relationship and how Israel sometimes disobeys and goes astray, things go wrong but God never forgets his covenant promises. Even the Psalm that we read this morning was all about the covenant between God and his people. Though you may not have noticed that, you probably noticed that it was a little bit repetitive with the same phrase being repeated over and over again: “for his steadfast love endures forever.” Well, there is a reason why that phrase was considered so important that they needed to keep saying it over and over again in that psalm. “Steadfast love” was a key technical term in the forming of ancient covenants. It was the quality in a person (or group of people) that made them committed to keeping the covenant. If God had steadfast lovingkindness, the Israelites were saying, they they could be sure that God would never desert them or abandon the promises he had made to them. God’s steadfast love – his covenant commitment – was the driving force behind everything that he had done for them. And, of course, covenant isn’t just an Old Testament idea, it is also the foundation of the New Testament. Christians proclaimed that Jesus had come to create a new covenant with his disciples – a covenant not based on laws and rules, but a covenant of faith that we celebrate and renew every time we perform a baptism and every time we gather to celebrate the Lord’s Supper. This concept of a covenant making God revolutionized everything about the relations of God with his people. It gave people hope and security to know that they had a God who would not forget them or his promises to them. 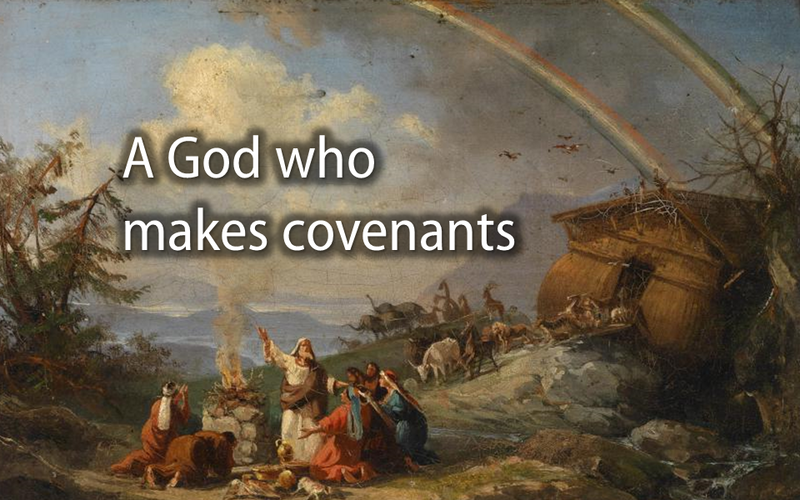 What does it mean today to know that our God is a covenant making God? It should continue to be a source of encouragement to us. Every time you are tempted to think of God as a God who is out to get you, to punish you for the slightest mistakes or to make you suffer for the decisions you made earlier in your life, you must remind yourself. Look for some monument that will remind you of God’s steadfast love – a rainbow in the sky, a baptismal font, a loaf of bread, the glory and beauty of nature. These things are placed there as a continual reminder to you that God is a God who makes promises to you and will never fail in them. These things will remind you that God has already given you his steadfast love and that his steadfast love endures forever. Knowing such things, reminding yourself of such things truly has enormous power to change your perspective, change how you see God and how you see everything. So know this one thing about the God that you worship – that God is a God who makes covenants.